Dedicated readers will recall that I teamed up with some local friends in early June to begin brewing our own beer. During that first session, we did all the major barley-flake boiling, malt syrup dumping, hop-infusing and yeast sprinkling, then left the 5-gallon mixture sitting in a jug in my cool dry basement to ferment for four weeks. In what is still one of humankind’s greatest accomplishments, this mixture magically became beer. Following the instructions from the Bald Brewer, we then siphoned it to a second 5-gallon container and let it sit for a couple more weeks. Then it was time to put it into the bottles. On the day before I left for my current vacation, The Triple M Brewing Team gathered a third and final time to boil up a 5-ounce mixture of sugar and water to mix with the beer and then siphon the whole deal into a long line of very clean and sterile 22 ounce bottles. I connected a new faucet supply shutoff valve to the end of the siphoning tube to allow precise filling, an improvisation which seemed to work well. We used the cap-installing device from our Craigslist homebrewing kit to seal each bottle once it had been filled. Then it was time for the third and final conditioning stage – leaving the bottles for a couple of weeks in a dark but non-refrigerated place. Here the extra dose of sugar apparently feeds the remaining yeast which releases carbon dioxide into the sealed bottles, yielding properly bubbly beer. Each Mustachian took home his own share of the bottles. Mine are (I hope) still bottle-conditioning in my basement and I’ll visit them when I get home. But I got an email this week from Mike, who cracked one of his bottles a little early. He reported that the quality is Stellar! This was unexpectedly good news for me, since it was only our first attempt at brewing. It seals the deal on our future of homebrewing, since the whole experience was quite fun, and fairly speedy and cost-efficient as well. As for the beer itself – it is called “Eighth Avenue Amber”, after the store location of the Bald Brewer. From our sampling during the bottling stage, I determined that it is a moderately dark beer with nice Grownup flavor, and a good amount of hoppiness as well. Not anything like Sierra Nevada hoppiness, but more than plain dark beers like Negra Modelo. Note that I am in no way a fancypants food or beverage writer so I don’t know the special words for describing these things. But that is how I like it, since in general I shun fancypantsiness in any form. I would like to publicly challenge the other three brew team members to begin the next batch RIGHT NOW while I’m away, so we can get four weeks of fermenting done before I return to Colorado! And now that we’ve completed the full cycle, I can safely recommend home brewing to other do-it-yourself types who have considered this hobby as well. It’s not an ultra-productive money-saving technique like biking to work is, but at least it is a great challenging hobby that pays for itself and encourages gathering with your friends – exactly the type of hobby that you need on the path to becoming a multi-talented and wealthy Early Retiree . 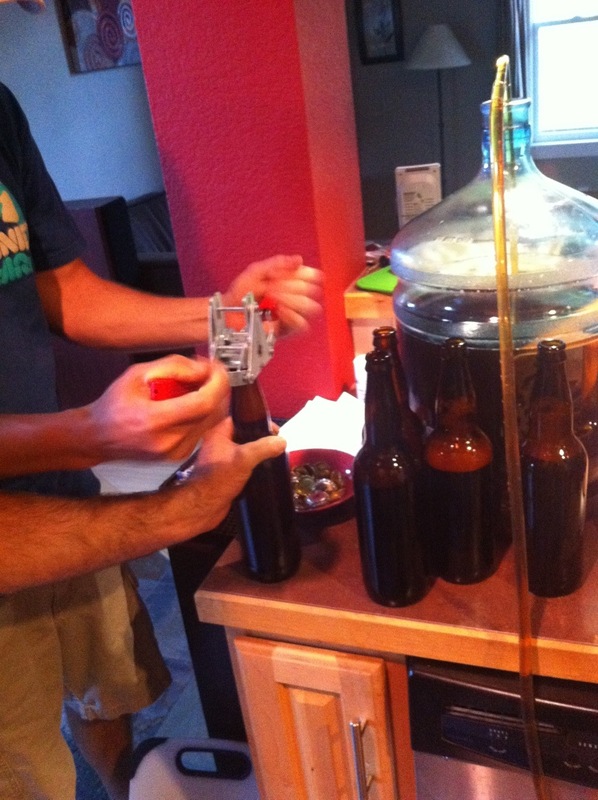 You can do a little taste as you’re bottling to get the overall flavor of the beer. I usually fill a shot glass or four as I’m doing the bottling. No, it’s not carbonated at that time, but you’ll know basically what you’re going to get. That’s my favorite part of the process (well, besides drinking it at the end, of course), but it’s just so hard to wait the full cycle before having any. What did Triple M brew for their original batch? My brother just did some mead that should be ready in a couple weeks. Never had it myself, but I’m going to give it a shot. Good question! It’s an amber beer – I just updated the article to include that key detail – thanks Kevin. Congrats on brewing great tasting beer your first go-round. I highly recommend Randy Mosher’s book Radical Brewing for recipe ideas. Brewing beer is definitely as much fun as drinking it – and even better when done at the same time! Most ales only need 1-2 weeks fermenting before you can bottle it. (If you aren’t reading its gravity with a hydrometer use 2 weeks just in case.) Even if you wanted to condition it in a second 5 gal. bucket you might want to do so after 2 weeks so it doesn’t stay on the yeast so long. Yeast autolysis doesn’t occur until 5+ weeks after active fermentation has completed. It’s MUCH better to leave the beer on the yeast, so that the yeast can clean up after themselves. Although commercial breweries can turn around Ales in less than a week, they are pitching an abundance of active yeast. Ferments fast, and ferments clean. Most homebrewers underpitch, old lazy yeast and also under oxygenate, requiring more time to condition and for the yeast to reabsorb the bi-products of fermentation, that is unwanted in most, if not all, beer styles. We’ve homebrewing in our apartment for 1.5 years now, buying grains and hops in bulk and dispensing via a small two-tap kegerator. In a city apartment it takes extra care to keep everything organized and not let it take over our space but so far so good. and the brewing process itself is a blast. Save money on going to bars :-). Also, from personal experience, homebrew = not even the slightest hangover feeling…which leaves me wondering what’s in the commercial beer that makes your head hurt so much? I’ve definitely imbibed a few more homebrews than necessary in the past, and woke up feeling great. Then again, I never brew 9% bombers, so who knows. YMMV. Thanks for the tips everyone! I do have much to learn but it all seems worth learning to me. I like the idea of the all-grain batch.. Partly to reduce ingredients further. I also want to move up to larger batches, if we can find a 10-30 gallon fermenter. As with all lifetime hobbies, I need to pace myself and soak up knowledge over time. Glad there are so many fellow brewers out there in our club of readers! Did you consider something a little easier, like a Mr. Beer kit? Mr Beer kits aren’t really much easier than the “normal” concentrate-based brewing MMM did. The cost of the of them vs. the quality of the equipment isn’t very good either, so I doubt MMM would think they were a good idea. If you brew direct from grain it’s a bit harder and requires a bit more time and equipment, but the ingredient costs are much lower and you have complete control of the end product. Inspiring. My buddy and I are halfway there… we currently get our beer from a ‘UBrew’ here in BC. In Canada, particularly BC, the govt tax grab is an outrageous 130% markup on the original cost! The UBrew is a service where they handle the beer making activities and storage and all you have to do legally is pitch the yeast and bottle. It ends up being 1/2 the price, better quality, with no headache inducing preservatives. The bigger bang for our buck however has been making our own wine… We make a couple of hundred bottles between the two of us at an average cost of about $5/bottle all in. We could get cheaper grapes and go as low as $3/bottle, but we’re going with top end premium grapes. We’ve done blind tastings and both our Pinot Gris and Zin have routinely beat $30+ bottles. Picking up the Cab Franc grapes on Wednesday! Woo hoo!! I should also mention, that brewing is one of those hobbies only certain people would enjoy. Like many post on this blog, I enjoy food made from scratch using quality ingredients, I would enjoy drinving a stick shift over and automatic car, I would ride my bike or motorcycle in the rain as the only form of trasportation, etc etc. I think brewing beer appeals to people who enjoy the experience as much or more than the destination. I think this site appeals to people of this character. Why won’t you just drive to the store and buy some bud light? It’s one of those things explanation can’t convey. I highly recommend getting a sixtel keg and a CO2 tank. You can avoid the whole process of bottling, and your beer will be less yeasty. Also, you really should try making cheese. It’s a simple process that actually can save you lots of money if you appreciate the really expensive cheeses. MMM, If you get into all grain, you may want to check out a local brewery/brewpub to get grains. I am getting 50 lb bags of Briess 2-row for $20 at a local brewery. (I do have to drive to pick it up). If you brew and Keg/bottle on the same day you can put the cooled beer on the yeast from the previous batch. Grow some hops and you are looking at some pretty cheap craft beer. In case you haven’t tried out other adventures in homebrewing, give hard cider or mead a try. It is faster to the fermenter than beer as it takes about 15 mins. to get a 5 gallon batch together. For cider, add any good quality ale yeast to some 100% apple juice… make sure it does not contain any sorbates. Vit C added is okay. Let it ferment and then rack it right into bottles or into a secondary fermenter and add fruit, spices, or what ever you think goes good with hard cider flavor. The mead process is pretty much the same. Pour 2.5 lbs. of honey into a bit less than a gallon glass jug filled with water, add wine or ale yeast, about 10 raisins as yeast nutrient, and shake the beezeejeus out of it, cap with an airlock and let it go for at least 4 weeks before bottling. Mead ages well. This is a very condensed explanation but hopefully it gets some people curious enough to seek out more info and try it out. Happy fermenting. Careful adding more sugar to the fermented hard cider and then bottling it. You will make some bottle bombs very fast unless you are kegging. However if you want to drink flat and sweet cider in the bottle I guess that would work. I love drinking and brewing beer, and if you live in BC, Canada (as a previous poster mentioned) you pay way to much in tax on booze. The best part here? Grain is considered a staple food so has absolutely no tax on it! Whew! A good 6 pack of local brew will set you back $13-14, the absolute worst crappy beer is $8 a 6 pack. If you go out, expect to pay $7 a sleeve (or if you’re lucky, a true pint. This is a median price). Maybe you have to boil your wort outside, so add another $0.75 for your favourite fuel source. You’ll definately want to use a CO2 setup, so add $0.50 per keg for that. LESS than one beer of equivalent quality in a restaurant, and that’s assuming you only drink 1! So the mark up on the one bought in a restaurant is 4600%. I can’t “make” gasoline, but I can brew beer, so I do. Versus similar quality in a bottle from a local brewery, the markup would be 1200%.